A stack of new cookbooks sits on my coffee table, and I can’t put them down. I’ve got pickling books, a bread book, an Italian book and a Japanese homestyle cookbook. It’s all very overwhelming, but I’m taking them one at a time. So after pickling some lotus root, gratineeing some cauliflower, and baking a savory loaf of bread, I closed them and looked at my leftover ingredients. A trip to the market for seafood, and a glance at a chicken and sake recipe in the Japanese book later, this simple stir-fry was spurred. Why blog about recipes that are already published anyway? If this dish sounds a little non-intuitive at first, one way of de-mystifying it might be to think of the Japanese rice wine, sake, as European white wine. They’re great for cooking with seafood, either one. This dish is not beholden to any of the vegetables, either — certainly not the crazy red carrots I had, since they stained the entire dish with a purplish tint. 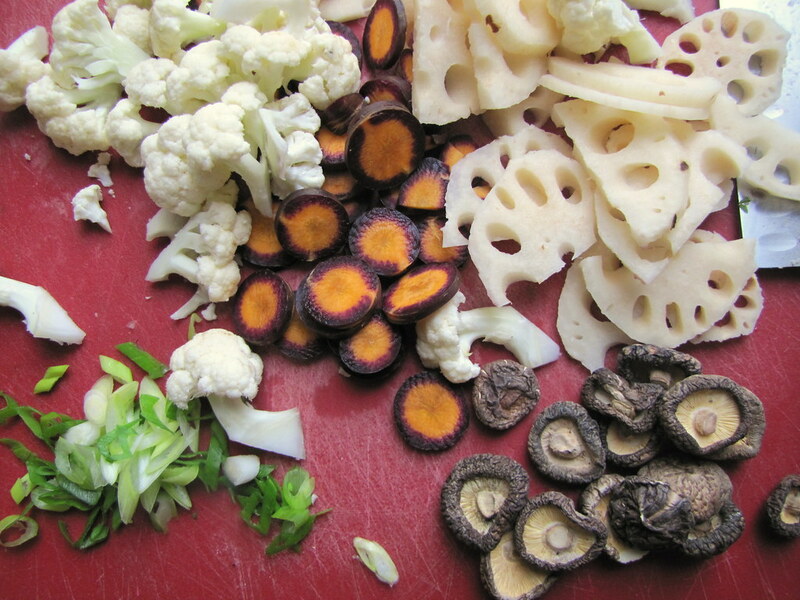 But the lotus root adds a distinct, crunchy texture as well as unique visual appeal. Quickly cooked, they’re neutral-tasting, with the crispness of water chestnuts, or a raw potato with much less starch. With most stir-fries, I separate the vegetables from the proteins to cook in different intervals on the pan. Each one is so short, though, it’s not a tedious task. I’ll begin by browning the proteins, to give the bottom of the pan some flavor. In this case, the scallops are gently seared on both sides in oil (after being seasoned while raw with salt). They can be just underdone once taken out of the pan. Then it’s the confetti of vegetables’ turn. Once the veggies are crisp-tender — and you’ll want to cut each kind to a size that will help make this possible at the same time — the scallops are thrown back in the pan, along with final splashes of seasoning. Rice wine, soy sauce, and a thickening agent of cornstarch mixed with these liquids and some water. I added a pat of butter to this, definitely not a typical Asian flair, but one that adds a bit of richness (it’s a healthy dish, why not?). Scallions go down last, once it’s passed the taste test. When it’s all said and done, this feat should have taken somewhere around ten minutes cooking time total, no more. Depending on the size of your scallops, it could be even less. It’s a sin to overcook them, as they’ll become rubbery, so you’ll want to make sure everything’s ready to go — the vegetables are cooked enough, the cornstarch mixture is prepared — before they’re added to the pan the second time. Pinkish and pillowy, these silver dollar-sized scallops were from the Long Island fishery Pura Vida, which sells at Union Square Greenmarket on Fridays. I don’t indulge in seafood often, so when I do, it’s nice that there’s a friendly and knowledgable purveyor to consult, sort of like when one is making a rare purchase of fine jewelry. The folks at Pura Vida are just great. 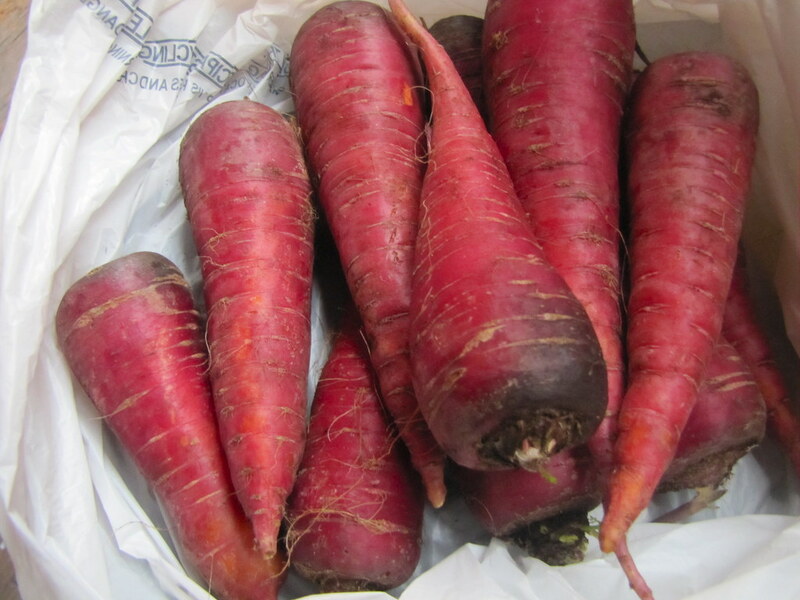 I’ll have to forgive these strange carrots for painting everything purple. They’re a rare breed, a small-farm find, and though their redness was only skin-deep (the insides are orange) they were tasty and sweet, a real seasonal treat. I may have to pickle some to preserve them next. If using dried shiitakes instead of fresh, pour enough hot water over them to submerge and cover until reconstituted, about 15 minutes. Let cool and reserve soaking liquid to use instead of water in the recipe. Season the scallops with salt in a small bowl. Heat oil over medium-high flame in a large saucepan. Once oil is hot, place down the scallops and let cook without turning for about 1 minute, to gently brown. Flip and cook another half minute or so, until just browned and remove scallops from pan. Add a little more oil to the pan if necessary, and once it’s hot over a medium-high flame, add all the vegetables and garlic (except the scallions). Cook, stirring frequently, and season with salt and white pepper. After 2-3 minutes, or until vegetables are just tender, add the sake and soy sauce and return the scallops to the pan. Let about half the liquid cook off. In a small bowl, combine the corn starch with the water (or reserved mushroom soaking liquid) until dissolved. Clear aside the center of the pan and pour in the corn starch mixture, stirring immediately. Sauce should thicken slightly once it begins to bubble; stir everything together and taste for seasoning, adding extra soy sauce, salt or white pepper as desired. Remove from heat and add optional butter, swirling until just melted, and scallions. Serve with white rice immediately. 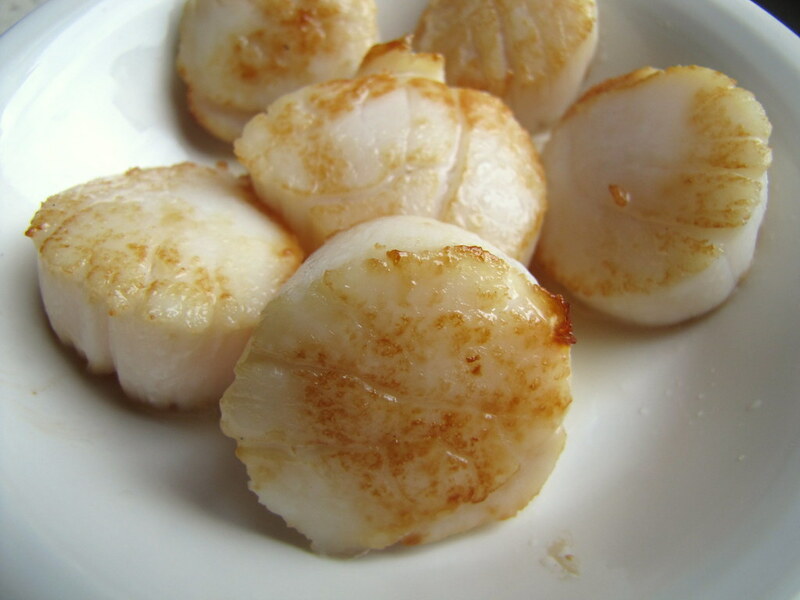 Six brownie points: Scallops may look and feel relatively fat-free, with a uniform texture and mellow, sweet taste. But as with many types of shellfish, they’re high in cholesterol. Yet as with most seafood, they offer omega-3 fatty acids, much-needed in the American diet, as well as B-vitamins. Fresh carrots and cauliflower are the most nutritious accoutrements in this dish; better to pack it with mostly fresh vegetables like these. Seven maple leaves: It’s a locavore meal with an exotic twist, so there’s a few far-flung ingredients. The sake and dried shiitake mushrooms were both imported (though fresh shiitakes can be purchased locally, albeit for a much higher pricetag), and I have no idea where the lotus root I bought in Chinatown was grown. But the rest is in season locally and as fresh as ever, including those scallops from Hampton Bays. how ironic? after leaving my farmers market and grabbing some shrimp i just made a stir fry off the whim, then came to check out your blog…I’ve recently heard about sake as I picked up a copy of Jaden Hair’s Steamy Kitchen at my local library…I’ll have to give that a go one of these days. Your dish looks FABULOUS!!!! I love veggies and scallops so this is perfect, I’m dying to find out how those lotus roots and red carrots taste like. Oh my gosh! This looks sooooo delicious. 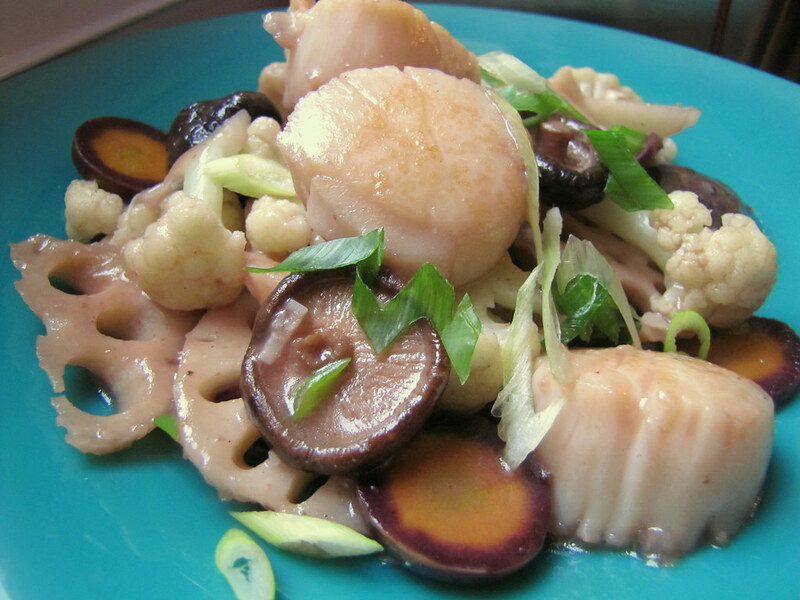 I love scallops and mushrooms and after a trip to Japan, an appreciation for lotus root. I’m going to try this recipe.